The headline is "Calling 911 in rural California? Danger might be close, but the law can be hours away," and four Sacramento Bee journalists contributed to this major feature, which has been in the works since December, 2017. I was gratified to see the story--which documents the reality (and consequences) of lack of effective law enforcement and high per capita violent crime rates in California's nonmetro counties. To be clear, the news is bad, but I was gratified in that the story confirms work I have been doing for more than a decade now (some of it documented in this blog since September, 2007, 11 years ago this month). That work has been theorizing the difference that rurality makes to law's operation and people's attitudes about law. In other words, what is the legal relevance of rurality and, thus, why should legal scholars attend to rural difference? why should "rural" be a category of analysis in the implicitly urbanormative field of law? Just a few years ago, I published a chapter on this issue in a volume of legal geography essays. Mine was titled, "The Rural Lawscape: Space Tames Law Tames Space." My argument was that rural spatiality is in tension with law. That is, the distance between homes and the distances that legal actors must traverse in order to exert law's authority--to make law meaningful--practically disables law. Technology can help (that is, time can trump space), but it's costly and cannot always be a substitute for the presence of human law enforcement. Further, rural residents' sense that they must be self sufficient is reinforced by this lived reality. As academics express it, society, spatiality and law and all mutually constituting or co-constitutive. If people know that legal actors such as law enforcement are effectively not present, then they know they must take care of themselves. In a sense, the lack of efficacy of law promotes a sort of frontier justice or informal order. Now, the empirical work of these Bee journalists confirms my theorizing with hard data about the number of sheriffs deputies per 100 square miles in California counties--including those all across the state, not just in the northern third on which Sac Bee usually focuses. These journalists also look at violent crime rates, confirming that many of the highest crime counties are "rural" according to the metric used by the reporters: Alpine (with a population of just 1,175, the state's least populous county, in the eastern Sierra) and Lassen (in the northern Sierra) lead the pack. Third is metropolitan San Joaquin County, home to Stockton. Plumas (again, northern Sierra) is next, followed by the state's most urban county, San Francisco, then nonmetro Inyo, Shasta, Lake and Modoc. Of course with populations as low as those of many of these nonmetro counties, the violent crime count doesn't have to be very high to rise to the top of the per capita heap. Indeed, it would be interesting to see data on deputy sheriff per 1000 residents vs deputy sheriff per 100 square miles. How different would the map and rankings look then? And which is the more salient metric, given the significance that material distance plays in rural lives? The Bee story begins with information about a 2011 double murder in the Trinity County community of Kettenpom, nearer to Mendocino County than to Weaverville, the Trinity County seat. In that case, Trinity County law enforcement asked the neighbors of a couple who called 911 to check in on that couple because sheriffs deputies coming from Weaverville were several hours away. The incident ended badly, with the responding neighbors severely wounded and the assailant, who had killed the couple who initially called 911 by the time the responding neighbors arrived, also dead after a car chase. The responding neighbors, Norma and Jim Gund, are suing the Trinity County Sheriff (in a case now going to the Supreme Court of California), and in the related story by journalist Ryan Sabalow observe, "Over here, we have to take care of ourselves." Any trust they had in the sheriff's office has disappeared, the story reports. (The separate story about this law suit is well worth a read, especially for legal eagles who will be interested in the arguments of the respective parties, including the assertion that the Gunds were effectively "posse comitatus," which happens to be the name of a far-right survivalist group). We have freedom with responsibility out here. We can do a lot of stuff. These guys [sheriffs deputies] referee. Wow, law enforcement as referees for what residents want to do? This is sounding like the wild west, indeed. (As it happens, I am in the midst of reading about the wild west in Wallace Stegner's Pulitzer Prize winning Angle of Repose, which features vignettes where vigilante justice takes over, much to the dismay of eastern transplants to places like Leadville, Colorado in the 19th century). As urban areas such as San Francisco, Los Angeles, Sacramento and Fresno grapple with discussions about use of force and the over-policing of minority communities, the state’s rural counties face a growing and no-less-serious law enforcement crisis: a severe shortage of staff that puts the public — and deputies — in danger. A McClatchy investigation found that large stretches of rural California — where county sheriffs are the predominant law enforcement agencies and towns often run only a few blocks — do not have enough sworn deputies to provide adequate public safety for the communities they serve. While the Sacramento County Sheriff’s Department employs nearly 160 deputies for every 100 square miles it covers, the tiny sheriff’s departments in Madera, Mariposa and Mendocino counties employ about four deputies for the same amount of turf. In Del Norte and Alpine, the counties make do with two deputies per 100 square miles. Those figures include non-patrol personnel and those who work in county jails. Also, consider the role that the phenomena of distance and personnel shortage played in this tragic story out of Tehama County last fall. Perhaps these Rancho Tehama events gave the Bee journalists the idea for this story. The McClatchy story features a color-coded map that shows the number of law enforcement officers per 100 square miles (again, what would it look like if deputies per 1000 residents?). It reminds me of maps I have helped to produce here showing lawyers per capita in California counties. Guess what? As with law enforcement officials, nonmetro counties have shortages of lawyers. Another interesting theme/revelation in the story is that no deputy actively patrols in some counties, e.g., Mendocino, for some parts of the night, though deputies are on call from their homes. When I wrote something similar on Legal Ruralism about my home town in Arkansas a few years ago (see here, here and here), students in my Law and Rural Livelihoods class were shocked to imagine a place with no law enforcement on duty 24-7, yet it is happening here in California, too. Tex Dowdy, the sheriff-elect of Modoc County, said an influx of transient residents drawn to the low cost of living has made identifying suspects harder for Modoc’s deputies. It isn’t the same place where we used to live. You used to recognize the bad guy walking around the street because he was in the paper every week. Note the lack of anonymity theme, about which I have written a great deal in the last decade, including here and here. The sheriff basically confirmed what I have argued: in rural counties, the "usual suspects" is as powerful a type of profiling as racial profiling, if not more so (and, of course, the two can overlap). Things go on in the hills all around us that go unreported. We know that. Daily. It happens. It’s something that we’ve just gotten used to. There are shootings that occur in the middle of the night. ... We know that there’s kidnappings, we know there are people getting brutalized out in the hills, we know there are people getting robbed. Honsal's quote reminded me of this feature by Reveal last fall, which I blogged about here, regarding wage theft and sexual abuse of "trimmigrants" in places like Humboldt and Trinity County. Of course, immigration status can also make people reluctant to report a crime, a particular concern in places like the San Joaquin Valley. The Chief Justice of California has, for that reason, criticized ICE for any presence in California courthouses. Until recent years, many rural departments had regional substations and hired “resident deputies” who lived in the remote areas they served. Those resident deputies knew their territories and most of the locals by name, making it harder for crime to go unnoticed, said multiple sheriffs. Resident deputies also allowed for quicker response times. Indeed, in my recent drive up California 299 from Burney (Shasta County) to Alturas (Modoc County), I saw a sign indicating such a remote outpost of the Lassen County Sheriff's office in Bieber, which is near the Modoc County line and also not far from Shasta County. Yet it is technically in Lassen County, and how interesting that the Lassen Sheriff's substation should be at the school, of all places. (More photos from that journey are here and here with more to come in future posts on access to justice in rural California). A few years ago, I also photographed a Siskiyou County Sheriff's substation in Dunsmuir. Though it is at the southern edge of the county, it is hardly remote given its locale on I-5. The state compensates counties for protected lands, too, but that funding has been controversial and even less predictable. Since the 2015-2016 budget cycle, the state has given rural counties $644,000 for payments in total each year to be divided among them, said state Sen. Mike McGuire, whose coastal district spans seven counties from Marin to the Oregon border. I have written previously here and here of the constraints that lack of tax revenue on federal lands place on local governments in rural areas, especially in the West, which has a much greater percentage of public lands than the rest of the country. The impact of shrinking federal dollars on law enforcement in Southern Oregon has attracted media attention in recent years. As for that state contribution, less than $700K/year spread among seven counties is pretty pitiful, even in the context of a paltry rural budget. A sixth theme of the story is that the state practice of re-alignment (re: prisons and local jails) has not served nonmetro counties well. The Bee story includes a few interesting quotes to illustrate the conundrum re-alignment has created for county law enforcement. A seventh theme is the lack of mental health support. Rural counties have 0.9 psychiatrists for every 10,000 residents, about half the statewide average, according to California Medical Board data. Mariposa has been experimenting with “tele-doc” video technology to connect jail inmates with mental-health professionals in other counties. Of course, telemedicine is being used to provide mental health and other services in rural counties generally, and not only to incarcerated populations. An eighth theme regards reliance on other law enforcement agencies, including not just California Highway Patrol, but also both federal and state game and fish officers. The photos show a sign at the California Highway Patrol office in Weaverville (Trinity County), which sits next to the DMV office. I assume that the sign encouraging reports of vehicle theft responds to the reality that rural residents report crimes at lower rates than their urban counterparts, even when the perpetrator is a stranger. The other photo I took in Weverville this summer is of a USDA vehicle, reprsenting the sort of law enforcement proxy that game and fish commissioners sometimes represent in rural areas. Back to the budget/economics note, I'll close with this stunning data point: rookie deputies in Modoc County earn $13/hour! I assume baristas in Los Angeles are paid better than that, especially if you take into account tips. I've been keeping an eye on elite bashing of working class and rural whites for years now, and I published my first article about it as long ago as 2011. But the election of 2016 brought the disdainful badmouthing by the chattering classes to a fever pitch, and I've occasionally blogged about the phenomenon, including here and here. One "series" I see on Twitter begins: "And in today's episode of: I Bet I Know Who You Voted For..." That is the common preface to re-Tweets of headlines that could previously have appeared in the "Darwin Awards" or perhaps the petty crime pages of a local paper. I'm pasting one below. It re-Tweets a Fox News Tweet that reads "Substitute allegedly brought boxed wine to school, vomited in class." Another re-Tweets this Fox News Tweet: "Woman charged with choking teen for blocking view at Disney fireworks show." On a related note, here's an item from Instagram just a few days ago, from the account called guerrillafeminism that reads "happy international women's day except the 53% of white women who voted for trump." Pat Bagley, the cartoonist for the Salt Lake City Tribune (whose work I greatly admire, by the way--both cartoonist and paper), has referred to Trump's "idiot followers." I could provide many more illustrations of this phenomenon. independent nonpartisan policy institute that is dedicated to improving the lives of all Americans, through bold, progressive ideas, as well as strong leadership and concerted action. Our aim is not just to change the conversation, but to change the country. The teachers of West Virginia are heroes. They deserve good pay and a real raise. I stand with them. Now, I don't recall any past Tweets by Tanden blasting Trump supporters, though I do recall some highly critical of Trump. That's fine by me. It's a line I've drawn myself--at least in the last year or so (I was a bit less discriminating--a bit more knee jerk--as I reeled in the wake of election of 2016, and I sent off some angry, pejorative Tweets about Trump supporters as a monolithic group). I now readily take aim at Trump but try to be more thoughtful and circumspect re: Trump supporters. I'm looking to understand them, trying to listen empathically. 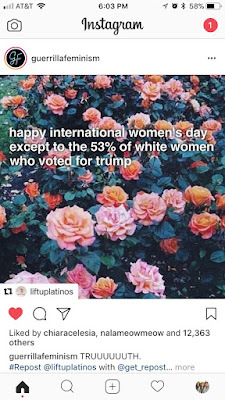 (I've got a whole law review article forthcoming about female Trump supporters, delivered as the key note address at the Toledo Law Review symposium in October, 2017, The Women Feminism Forgot: Rural and Working Class White Women in the Era of Trump. I hope to have the text posted soon on my ssrn.com page). But the bottom line is that some things I saw on Twitter about the West Virginia teachers--many sympathetic comments of the sort Tanden shared--had me wondering if the lefties doing this Tweeting realized that many of the folks they were lauding and advocating for had no doubt voted for Trump. That is, these newfound labor heroes with their wild-cat strike were one and the same with (many) reviled Trump voters. Some 68% of West Virginians voted for Trump! Could I possibly be seeing praise for these women--praise from the left? These are the same women that many lefties on Twitter have said "get what they deserve" if they lose their healthcare (thanks to Trump's effort to dismantle Obamacare) or face further economic decline (thanks, for example, to the long-term consequences of Trump's tax reform law). 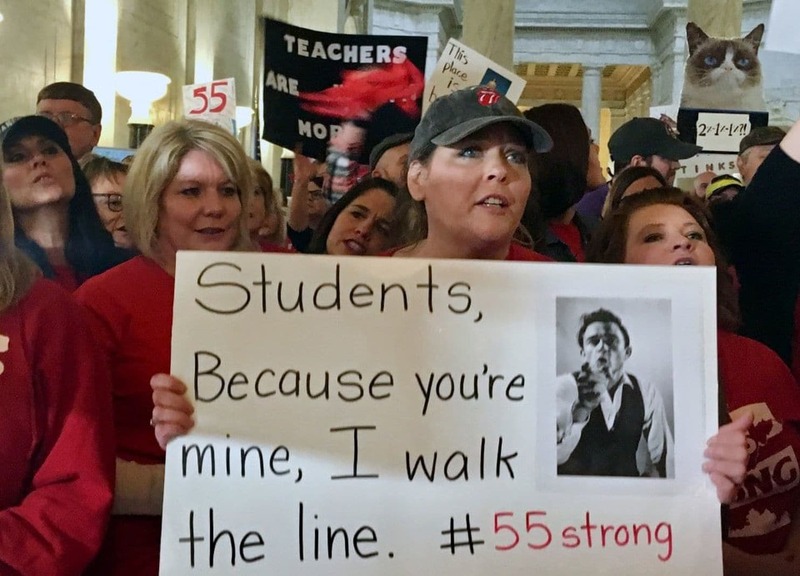 teachers and some other school employees in all of the state’s 55 counties are refusing to return to work until lawmakers give them a 5 percent raise, and commit to addressing their rapidly rising health insurance premiums. In the past, solid health care benefits helped make up for low wages, but because West Virginia hasn’t been putting enough money into the state agency that insures public employees, premiums and co-payments have been increasing significantly. Ah, there's that health care problem again, by which I mean you should read this and this, among other sources cited and discussed in that forthcoming Toledo Law Review article. Having pored over many, many mainstream media reports of white working class Trump supporters in places like Appalachia (you guessed it, all discussed in that Toledo Law Review article! ), I was struck that the women Goldberg identified and interviewed did not appear to be Trump supporters. Quite to the contrary, these women are held out as having responded to Trump's election by becoming part of what is popularly known as "the resistance." I was delighted to learn about and hear from these women, but was Goldberg unable to find any Trump supporters among the striking teachers? I would very much have liked to have heard their attitudes about the strike, also in relation to their support for Trump. Did they reconcile the two? Craig described the anti-Trump Women’s March, as well as the explosion of local political organizing that followed it, as a “catalyst” for at least some striking teachers. You have women now taking leadership roles in unionizing, in standing up, in leading initiatives for fairness and equality and justice for everyone. As a profession, we’re largely made up of women. ... There are a bunch of men sitting in an office right now telling us that we don’t deserve anything better. I sure hope Garvin is right that the sentiment and movement are as widespread as she suggests--and as Goldberg implies. If this is accurate, liberal elites--including feminists--will have to give Craig, Garvin and so many more like them their due. (Indeed, teacher strikes may be in the works in the equally "red" states of Oklahoma and Kentucky, too). That will challenge deeply entrenched stereotypes about folks from this region (read more here and here), which will in turn serve all of us quite well. By the way, the strike succeeded, with the teachers getting what they held out for. You can find more exciting coverage of the West Virginia teachers strike here, here and here. And don't miss this by WVU Law Professor and education law expert, Joshua Weishart. The question that all of this leaves me with is this: What can the WV teachers strike teach us about how to build and sustain cross-class coalitions, including among whites? How can these intra-racial coalitions interface with cross-race coalitions for even stronger pacts among progressives? And what role will gender play in that coalition building? Other hopeful news of change in relation to women and the national political landscape is here, here and here. Cross-posted to Legal Ruralism, Feminist Legal Theory, and Working Class Whites and the Law. Also related to rurality are these posts about spatiality and abortion access. Carol Sanger of Columbia Law responded to my post about her new book, About Abortion: Terminating Pregnancy in the 21st Century, here. I love the fact she says I get the "last word" in our exchange over the significance of geography. I expect to post another item or two before my term as a guest blogger expires in about a week. Campus Community Book Project and Addressing "The Divide"
Is this the "Age of the Wealth Gap?" Investigative reporter and Rolling Stone contributor Matt Taibbi says yes. His New York Times bestselling book, "The Divide: American Injustice in the Age of the Wealth Gap," is the featured work in this year's UC Davis Campus Community Book Project. It was my pleasure last week to take part in the first of three book events at the School of Law: a panel discussion titled "Addressing 'The Divide' - 'If You Cannot Afford One...': Access to Legal Counsel in the Age of Inequality." Speakers included Yolo County Deputy Public Defender Ronald Johnson '04, Legal Services of Northern California (LSNC) Executive Director Gary Smith, and LSNC Deputy Director Julie Aguilar-Rogado. As lawyers and professors involved in serving, researching and/or teaching about low-income populations and access to justice issues, we all agreed that little about Taibbi's book surprised us, even though Taibbi wrote as if he were shocked by his findings. Among the topics we discussed were the civil justice gap between wealthy folks and those who qualify for legal assistance from legal aid organizations such as LSNC, which is funded in part by the Legal Services Corporation. Smith and Aguilar-Rogado described how LSNC is not only providing direct services to low-income populations in the 23-county area they serve in Northern California, but how they are also pro-actively seeking enforcement of many laws that can assist the poor. In a sense, LSNC is acting as a private attorney general in advocacy to compel counties to live up to statutory mandates that would benefit low-income populations. I talked about the rural-urban justice gap, including the shortage of lawyers serving rural counties generally, and low-income rural residents in particular. Our talented alum Ron Johnson spoke about his decade of experience as a public defender. In particular, he talked about some of the particular struggles facing many who are caught up in the criminal justice system, problems including joblessness, poverty, and mental illness. Johnson observed that we need to devote more attention to such root causes of crime and mentioned that his office has social workers -- and not only lawyers -- to assist the clients. Two more Campus and Community Book events will be held at King Hall. On November 2, the clinical faculty will discuss the human impact of criminal and immigration detention. Then, on February 1, Professors Elizabeth Joh and Thomas Joo will discuss structural inequality in American policing and prosecution. For a full list of the book events across campus, visit http://occr.ucdavis.edu/ccbp2015/events/index.html. The events will conclude with an appearance by author Matt Taibbi at the Mondavi Center on February 3, a talk I am very much looking forward to hearing. The School of Law is pleased to host this year's Class Crits conference on November 14 and 15. This year marks the 50th anniversary of the enactment of the Civil Rights Act of 1964, President Johnson's declaration of a "War on Poverty," and the establishment of the first Neighborhood Legal Services Program pilot in Washington, D.C. Each of these initiatives attempted to address problems of structural economic inequality-problems that remain with us nationally and internationally. The seventh meeting of ClassCrits will focus on work, poverty, and resistance in an age of increasing economic insecurity. In law, it is generally easier to discuss "poverty" than to look deeply into its causes and incidents-including income and wealth inequality, the close interaction of class and race in America, and the connections between gender and economic hardship. It is also easier to discuss "poverty" than what some scholars call "precarity"-the increasing vulnerability of workers, even those above the official poverty line, to disaster. Precarity has both economic and political roots. Its economic sources include the casualization of labor, low wages, persistently high unemployment rates, inadequate social safety nets, and constant vulnerability to personal financial catastrophes. Its political sources include the success of neoliberal ideology, upward redistribution of wealth, increasing polarization and dysfunction in Congress, and the dependence of both political parties on a steady stream of big money. Precarity is also not limited to the United States, but is reshaping space around the globe. While the aftermath of the housing bubble and subsequent foreclosures drain home values across America and strip equity disproportionately from minority neighborhoods, in developing-country "megacities," millions of slum-dwellers are displaced to make way for high-end residential and commercial real estate developments. Finally, this conference focuses on challenging structural forms of inequality from a place of compassion and creating possibilities for resilience. In the words of Martin Luther King, Jr., "True compassion is more than flinging a coin to a beggar. It comes to see that an edifice that produces beggars needs restructuring." In this spirit, ClassCrits VII will explore the risks, uncertainty, and structural challenges of this period and discuss possibilities for shared goals and new forms of resistance. Speakers from the School of Law include Dean Kevin R. Johnson and Professors Angela Harris, Lisa Ikemoto, Lisa Pruitt, Darien Shanske, Leticia Saucedo, and Brian Soucek. For more information, visit law.ucdavis.edu/class-crits. The UC Davis Center for Poverty Research will host a major conference on the impact place has on poverty and effective interventions on November 13-14. Our own Professor Lisa Pruitt is the conference's organizer. The conference "Poverty and Place" will host leading scholars in sociology, economics, law, education, social work, geography and planning. They will present new research on how place can aggravate poverty, addressing different aspects of urban, suburban and rural challenges and solutions. "Concentrated poverty-whether in rural, urban, or suburban places-greatly aggravates the challenges facing those living in poverty, and place-specific or spatial barriers can undermine the efficacy of safety-net programs," said Professor Pruitt. "This conference takes up these and a broad array of other issues related to the geography of poverty." The conference will coincide with another conference, titled "Poverty, Precarity and Work: Struggle and Solidarity in an Era of Permanent(?) Crisis," held at UC Davis School of Law. This second conference will take place November 14-15. Visit law.ucdavis.edu/class-crits for more information. Cross-posted from The Life of the Law. Remember pagers? As outdated as they seem now, these were once seen as the technological tool of choice for drug dealers (to say nothing of doctors). The police also used to rely on “bumper-beepers” to track suspects in criminal investigations. There has always been an arms race of technology in crime and policing. Today, most people have some passing familiarity with the rapidly changing world of surveillance: the revelations about the NSA’s bulk phone metadata collection, the emergence of unmanned drones, and the growing sophistication of biometric technology. The problem is that most people aren’t well-versed in the Fourth Amendment’s third party doctrine, or the “business records” provision of the Patriot Act. The complexity of the law in these areas–and the fact that the concepts aren’t that intuitive–makes public debate about the appropriate scope of government surveillance difficult. That’s where the artists come in. There are a small but growing number of visual artists and designers who have raised questions about the tools of government surveillance in direct, provocative, and accessible ways. Case #1: Brooklyn-based designer Adam Harvey has created a series of wearable objects that draw attention to the tools of mass surveillance. 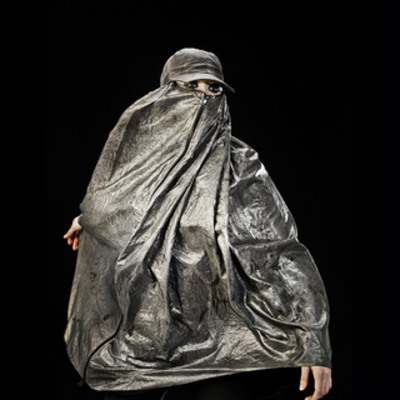 His Stealth Wear line of “anti-drone” clothing is made of a special fabric intended to thwart thermal imaging devices that could be mounted on unmanned police surveillance drones. (The FAA is in the midst of crafting regulations for a future in which unmanned drones will occupy our public airspace.) The state of the law on drones is changing. Although the Supreme Court’s Fourth Amendment cases probably don’t require the police to obtain a warrant for their use, many state legislatures are considering statutory limits. What Harvey’s work highlights in a direct and arresting way, however, is that the prospect of sophisticated eyes in the skies might force us to change our public habits, even our clothing, if we wish to retain some anonymity or privacy. Case #2: The police and Facebook alike are becoming interested in the capabilities of facial recognition technology. This biometric computer software can scan a picture of a face and compare it to a database of stored information. The computer algorithms in the software typically focus on the areas around the eyes, nose, and mouth. 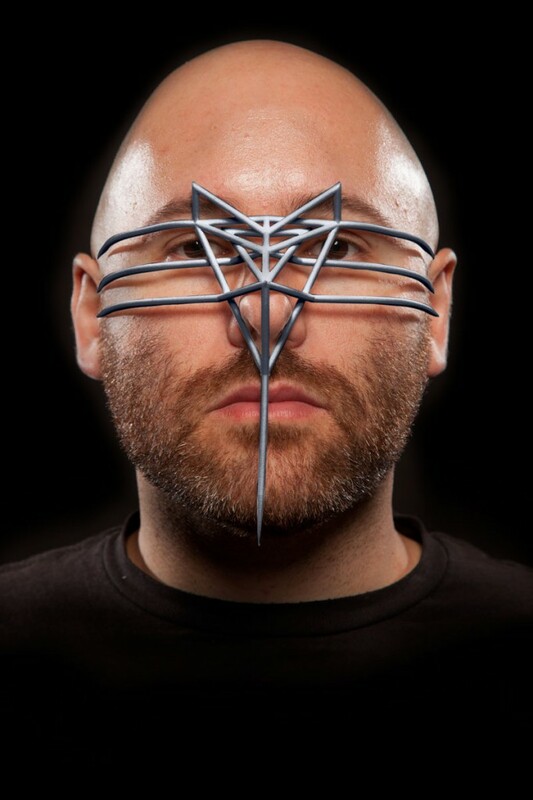 Artist Zach Blas’s Face Cages takes this idea and makes it literal: a painful metal mask that represents the areas targeted by facial recognition technology. Scanning faces in a crowd, like the use of unmanned drones in public spaces, is a murky legal area. The Supreme Court’s Fourth Amendment cases probably don’t provide individual protections against these biometric technologies. But Blas’s work suggests how such technologies may be “trapping” us in ways that nevertheless threaten widely held beliefs about privacy. 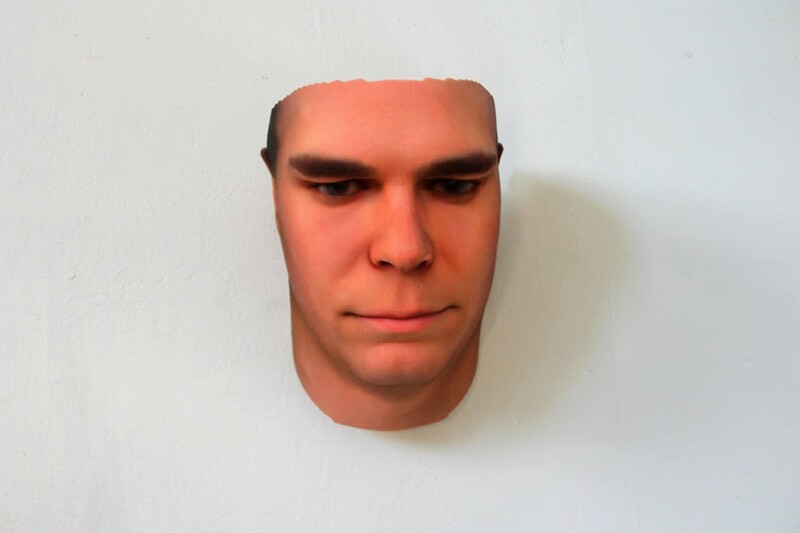 Case #3: New York based artist Heather Dewey-Hagborg’s Stranger Visions project takes on another cutting edge technology: the growing capacity of government to collect and analyze our genetic information. The art involves extracting DNA from discarded items Dewey-Hagborg finds in public spaces, such as cigarette butts and chewing gum. She then has the DNA extracted from these discarded items analyzed for specific genomic sequences associated with physical traits like hair and eye color, and creates life-size three dimensional masks of the persons she has “identified” from their garbage. Dewey-Hagborg’s faces are a best guess about the source of the DNA (although a recent scientific paper suggests that predictive modeling based on unidentified DNA samples could one day soon be a reality). The point isn’t accuracy, though. 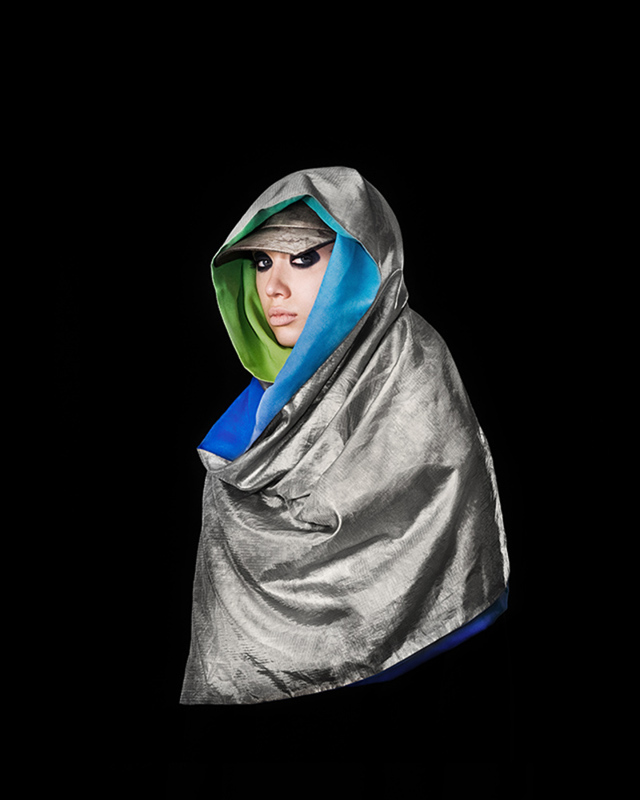 The Stranger Visions project asks us to confront directly how we feel about the fact that we are leaving genetic information behind everywhere we go. Should that information be considered as devoid of privacy expectations as the literal trash we throw away? Do we feel comfortable that third parties—both governmental and commercial—might be able to identify who we are from our genetic traces? The law here, too, is unclear at best. Enormous technological changes are making it possible for us to be identified, watched, and listened to in ways that were once unimaginable. What we should do about these changes is difficult because the surveillance is sometimes surreptitious, often complicated to understand, and undetermined with regard to is regulation. Art has the power to question, provoke, and reveal new truths to us. These artists are opening up the conversation about the place of surveillance and the law in our lives to anyone willing to watch and to listen. The passage of the Border Security, Economic Opportunity, and Immigration Modernization Act (Senate Bill 744) by the U.S. Senate is a major achievement. It includes provisions that would increase border enforcement, expand legal immigration, and create a path to legalization for eligible undocumented immigrants. As with all political compromises, SB 744 will not please everyone. Still, the reform proposal will in my estimation could well turn out to be the first major piece of truly "comprehensive" immigration reform since President Ronald Reagan signed the Immigration Reform and Control Act of 1986 into law. The new border enforcement measures in SB 744 build on previous enforcement measures, such as the expansion of the border fence along the U.S./Mexico border. More generally, the U.S. government has greatly ramped up border enforcement since the mid-1990s, for example, with the high profile border operation known as Operation Gatekeeper sought to seal the border immediately south of San Diego. This post focuses on one troublesome aspect of the Senate bill. The "border security" aspects, including the amendment sponsored by Republican Senators Bob Corker and John Hoeven added immediately before its passage in the Senate, are deeply problematic. The "border surge" amendment dramatically increases unnecessary enforcement, adding thousands of Border Patrol officers along the U.S./Mexico border and billions of dollars into further militarizing the entire region. In my view, the border surge would not reduce undocumented migration and thus constitutes a big waste of money and resources. To add insult to injury, the surge would also exacerbate some of the worst excesses of the current enforcement regime. 1. Record Deportations: The Obama administration has deported more noncitizens than any administration in U.S. history, setting annual removal records of about 400,000 a year. 2. Super-Aggressive Enforcement: The Obama administration has taken aggressive positions toward immigration enforcement, such as the Secure Communities program , which has allowed for record levels of removals and aggressive litigation positions, such as in Moncrieffe v. Holder, a case in which the Supreme Court rejected the U.S. government's efforts to classify a long term lawful permanent resident as an "aggravated felon" subject to mandatory removal based on one conviction for possession of the equivalent of 2-3 marijuana cigarettes. 3. Decreased Undocumented Immigration: Undocumented immigration has decreased due to the Great Recession and many Mexicans have returned to Mexico. 1. Destruction of Families: The removal of 400,000 noncitizens a year, many for relatively minor criminal offenses, has torn apart hundreds of thousands of families and communities across the country. U.S. citizen spouses and children have suffered as well as the noncitizens removed. This destruction of families is inconsistent with the goal of promoting family unity that long has been the linchpin of the U.S. immigration laws. 2. Racial Profiling: U.S. immigration enforcement long has been plagued by racial profiling of Latinos. By greatly expanding border enforcement and the number of Border Patrol officers, the bill will necessary expand racial profiling of Latinos, who are perpetually suspected of being foreigners. Profiling arguably has increased with increased state and local law enforcement involvement in immigration enforcement. Notably, a federal court in May 2013 ruled that Sheriff Joe Arpaio and his Maricopa County (Arizona) Sheriff's Office engaged in a pattern and practice of abusing the civil rights of Latinos in the name of immigration enforcement. 3. Border Deaths: One less well-known aspect of increased border enforcement has been the growing death toll along the U.S./Mexico border region. As enforcement has centered on major urban areas along the border, migrants have sought entry in more desolate locations where death due to exposure (i.e., heat in the desert) is more likely. Deaths on the border are a regular part of live in the border region. More enforcement, including extension of the border fence, will likely contribute to more deaths as migrants are redirected toward more desolate - and dangerous - locations. Many observers see the border enforcement provisions of comprehensive immigration reform as a political compromise necessary to attract votes, especially from Republicans in the House of Representatives. That may be true. However, there is little, if any, reason to believe that the measures will in fact reduce undocumented immigration. And there is every reason to believe that the enhanced border enforcement will have negative impacts on Latina/os and other Americans, tearing apart American families, increasing racial profiling and discrimination, and resulting in more deaths along the U.S./Mexico border. Conmsequently, we should view the political compromise with those significant costs in mind. Where does this analysis leave us? There are other parts of SB 744 that do make more policy sense, such as many of the changes to the legal immigration provisions (e.g., increasing the visas for high- and low-skilled workers, abolition of the diversity visa program, elimination of the long visa backlogs, etc. ), and the path to legalization for eligible undocumented immigrants, including the DREAMers who were brought to this country as children by their parents. The enforcement provisions do not help the bill achieve the policy goals of immigration reform. Moreover, the decision to double down on border enforcement will result in horrible collateral damages. It ultimately is a legitimate question whether the costs of the enforcement measures outweigh the benefits of the more positive policy aspects of the Senate bill. we also should keep in mind that the Senate bill may be as good as it gets. One of the most e-mailed items in the New York Times for the past day or so has been Claire Vaye Watkins "The Ivy League Was Another Planet." (The alternative headline is "Elite Colleges Are As Foreign as Mars.") In her op-ed, Watkins recounts her journey from nonmetropolitan Pahrump, Nevada to college at the University of Nevada, Reno. Her story is that of a kid from a working class family in "rural" Nevada (her description; technically, Pahrump is not rural because, though unincorporated, its 2010 population is more than 35,000) who didn't know about colleges or how to pick one. Lucky for her, Watkins went on to get an MFA from Ohio State and is now an assistant professor of English at Bucknell. Watkins writes of getting her wake-up call about dramatic variations in educational resources when she was a high school senior, vying for a prestigious state-funded scholarship. That's when she met a peer from a Las Vegas high school who attended a magnet school, took college prep courses, had a tutor, and had spent time abroad. The variations in resources, she realized, were based on geography: he was an urban kid and she was a rural one. But they were also based on class. She doesn't specify the background of the Vegas teen, but she mentions that her mother and step-father had not gone to college. I note that Pahrump's poverty rate is a fairly steep 21.1%. Just 10.1% of residents there have a bachelor's degree or better, compared to about 30% nationwide. Even after meeting the privileged teen from Vegas, however, Watkins didn't know what she didn't know. She remained ignorant of the world of elite colleges, a sector that represented the "other planet" or "Mars" of the headline. Instead, Watkins applied to UN Reno, she explains, because she had once taken a Greyhound bus to visit friends there. As Watkins expresses it, when poor rural kids apply to college (which, I might add, is altogether too rare), they typically apply to those institutions to which they have been "incidentally exposed." No college rep ever showed up at Pahrump Valley High school, while the military brought a stream of alums through there on a regular basis. The school devoted half a day each year to ensuring that every junior took the Armed Services Vocational Aptitude Battery (ASVAB); that test was free, while taking the ACT and SAT was not. "But the most important thing the military did was walk kids and their families through the enlistment process." Watkins closes by noting that elite colleges need to do more to reach those she calls "the rural poor," concluding that, until they do, "is it any wonder that students in Pahrump and throughout rural America are more likely to end up in Afghanistan than at N.Y.U.?" come from districts too small to support selective public high schools, are not in a critical mass of fellow high achievers, and are unlikely to encounter a teacher or schoolmate from an older cohort who attended a selective college. And where might those students be? mostly in rural schools. For folks like Watkins, it isn't hard to read between the lines and see that the high achievers most likely to slip between the cracks are kids in rural schools. All of this brings to me my own experience. Like Watkins, I can see that many of the "missing" students Hoxby and Avery are talking about are rural. My own K-12 school in rural Arkansas had an enrollment of about 400--and no counselor whatsoever to advise on college admissions. The first Ivy League graduates I ever met were professors at the University of Arkansas. I was there because, like many who Hoxby and Avery studied, I assumed it was the best bargain for me. I didn't apply elsewhere. I have to trust that the numerous people reading Watkins' tale will believe her revelations of her naiveté regarding college. I certainly hope so, though I have been struck over the years at how many people are incredulous at my similar tale. How, they marvel, disbelief in their voices, could you not have known to go to a "good school"? People of privilege can find it remarkably difficult to believe that other people could really not know the things that are the very intellectual and emotional wall-paper of a life of privilege. But there is another, related problem: poor rural kids and the diversity they represent often go unvalued by educational decision makers. Because these rural kids Watkins is talking about are often white, they don't appear, at first blush, to represent diversity. Plus, I find privileged whites are just as uncomfortable around working class whites as they are around people of color--maybe more so in this day and age. That discomfort--unmitigated by the need be politically correct because no PC imperative exists regarding poor whites--may deter the privileged from reaching out to recruit poor whites. After all, as Watkins points out, it's not like these elite colleges are hurting for applicants. Finally, privileged metropolitan and cosmopolitan types tend to hold the limitations of rural education against those who are products of it, discounting what these kids have achieved because of the absence of AP classes, the right extracurricular activities, and such. (Read more here and here). I recall being on the selection committee for the first round of elite Sturgis Fellows at the University of Arkansas in the late 1980s. When I spoke up for a candidate with what I considered to have stellar credentials, a professor on the selection committee quickly countered by noting that the student was from a rural school, suggesting that the student's achievements had to be kept in proper perspective--namely that s/he had not been subjected to true intellectual rigor. I recall meekly pointing out that I, too (then the University of Arkansas's undergraduate valedictorian) was the product of a rural school. What was I? chopped liver? or just an anomaly? I'll never know how the selection committee saw me. But perhaps because I protested so meekly, my comment--and the outstanding rural candidate--got no traction. All of that inaugural group of Sturgis Fellows, as I recall it, were from sizable high schools. Cross-posted to ClassCrits, UC Davis Faculty Blog, and SALTLaw Blog. 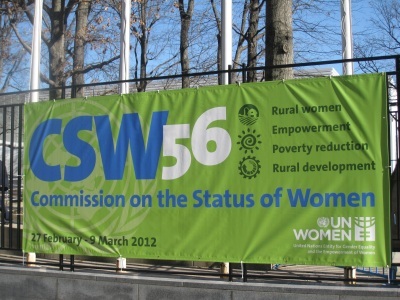 The United Nations 56th Session of the Commission on the Status of Women (CSW 56) featured as its priority theme this year "the empowerment of rural women and their role in poverty and hunger eradication, development and current challenges." This focus on rural women is long overdue, given that rural women comprise a quarter of the world's population. Further, women provide 43% of the world's agricultural labor, and they produce half of the world's food for direct consumption. In fact, non-governmental organizations (NGOs) discovered some time ago that women--referred to by many as the "architects of food security"--are key agents of development. One reason for this is that when women and girls receive income, they reinvest 90% of it in their families. In spite of their transformative potential to reduce hunger and poverty, women own less than 2% of land worldwide and they receive less than 10% of available credit. As one whose scholarship focuses on rural livelihoods in both the United States and abroad, I was pleased to attend three days of the two-week CSW 56 event (February 27-March 9) as an observer for the American Society of International Law. As a former gender consultant for the United Nations, I was prepared for some of what I saw (e.g., bureaucracy), but the experience also held a few surprises. One thing that intrigued me about the “Session”—which is not a session at all but a dizzying array of “high-level round tables” and other meetings, panel discussions, “side events,” and “parallel events”—is that discussion of law was relatively absent. Furthermore, relatively little of the substance of these gatherings focused on rural women in a way that went beyond adding the modifier “rural” to whatever issue was being discussed. 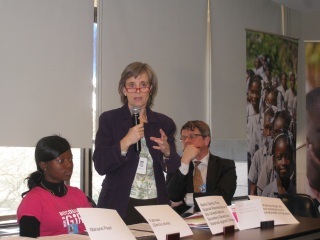 Rather than engaging with the circumstances that often distinguish rural women’s lives from those of their urban counterparts, many of the sessions seemed merely to “add rural women and stir” in relation to a well-recognized (and admittedly very important) women’s issue (e.g., female genital mutilation, child marriage). Other sessions did take up issues more central to rural livelihoods, including spatial removal from services and agents of the state, and women’s roles in agricultural production. The lack of significant engagement with the particular challenges facing rural women is reflected in the fact that none of the resolutions adopted by the Commission was about rural women. Nor did the Commission adopt any agreed conclusions on the priority theme of the 56th Session. Read more about Article 14, its history, and its implementation here, here, and here. Given the particular attention paid to rural women in this germinal women’s rights treaty, one might have anticipated considerable attention to the provision and its potential at CSW 56. Not so at the sessions I attended. I heard Article 14 mentioned only a couple of times. While most commentators in these parallel and side events presumed developing world contexts, a few offered reminders that biases against women persist in the developed world, too, including in relation to agriculture. In other words, Australia, Canada, the United States (just to name a few) all have work to do to empower women, including those in rural areas. (To be clear, unlike these other nations, the U.S. has never ratified CEDAW and is not bound by it). This sampling of events demonstrates my earlier points about both the relative absence of attention to law’s role in solving the problems of rural women (and perhaps, by implication, all women), and also the shortage of programming regarding issues unique to rural women. To the extent that the particular concerns and circumstances of rural women were center stage, the focus typically related to agriculture. Among these were issues such as access to credit and means of marketing their products, the relative merits of “sustainable” agriculture versus intensive production agriculture, and an issue that more squarely implicates law: women’s right to own land. Officials from UN Women reported that diplomats participating in CSW 56 were sharing examples of legislation that would achieve land reform and improve land distribution schemes, but in the next breath they acknowledged the challenge of getting these laws implemented and enforced. Face reality ... be honest. Even in America, who tells the law? Maybe [the victims and their families] are illiterate ... [child marriage] is their custom. Who goes to tell the law except the child? And how can the child go tell the law? This is where all of us come in ... if your NGO is interested in solving these problems. You go [to the village], watch the ways things are done and then talk to the educated locals [so that they begin to see the social and economic costs of the practice, e.g., child marriage]. And they will know they must do something. This woman, like many others I heard over three days, extolled the importance of grassroots efforts to achieve the empowerment of women. Wherever one might strike the balance between formal law on the one hand and local, grassroots efforts to educate and achieve cultural change on the other, few coming out of CSW 56 would dispute that both have significant roles in empowering not only rural women, but indeed all women. Originally posted to Jurist.org; cross-posted to Legal Ruralism, IntLawGrrls and Agricultural Law.